Muscle Wellness Nitro Charge is a concentrated preworkout giving athletes smooth energy and mental focus. This product is designed to give lifters and athletes a performance boost during their workouts. The recommended serving is two level scoops which will give you 130 mg of caffeine which has been well researched as an athletic performance enhancer. Athletes who are sensitive to stimulants like caffeine and still want to use a preworkout may consider using this preworkout. One scoop contains 65 mg of caffeine which is less than a standard cup of coffee (75 – 150 mg). Halving the servings will give you a product for 40 workouts which is great value at the current price. To maximise muscle gains proper exercise form needs to be maintained at a high intensity level. Studies have shown caffeine to increase mental focus which will improve your training and limit distractions in the gym. 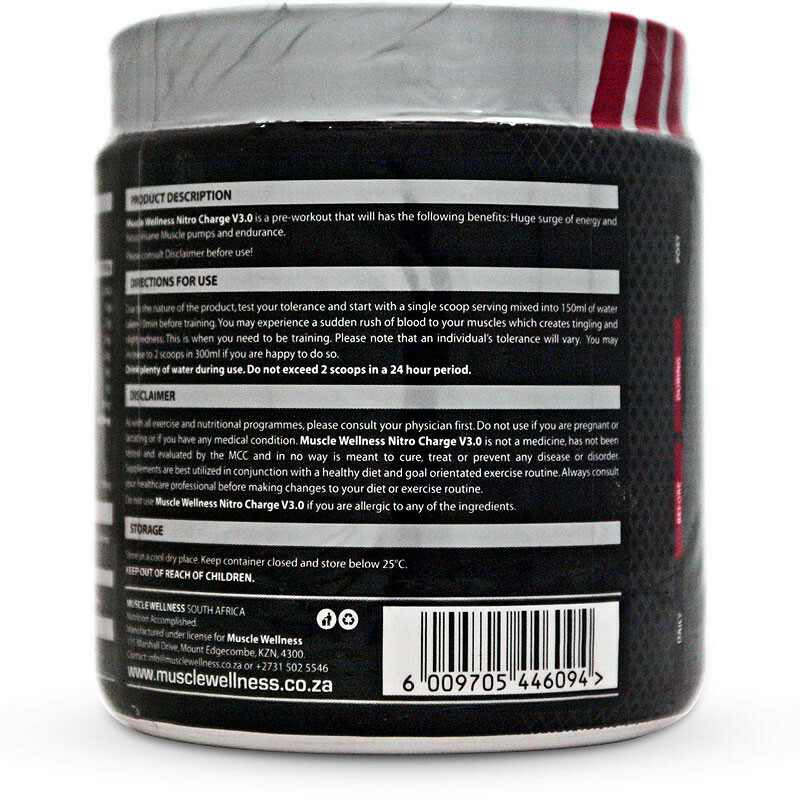 The blend of Di Creatine Malate and Creatine Monohydrate will increase power output during your lifting sessions. Training with heavier weight will stimulate more muscle fibre for growth. 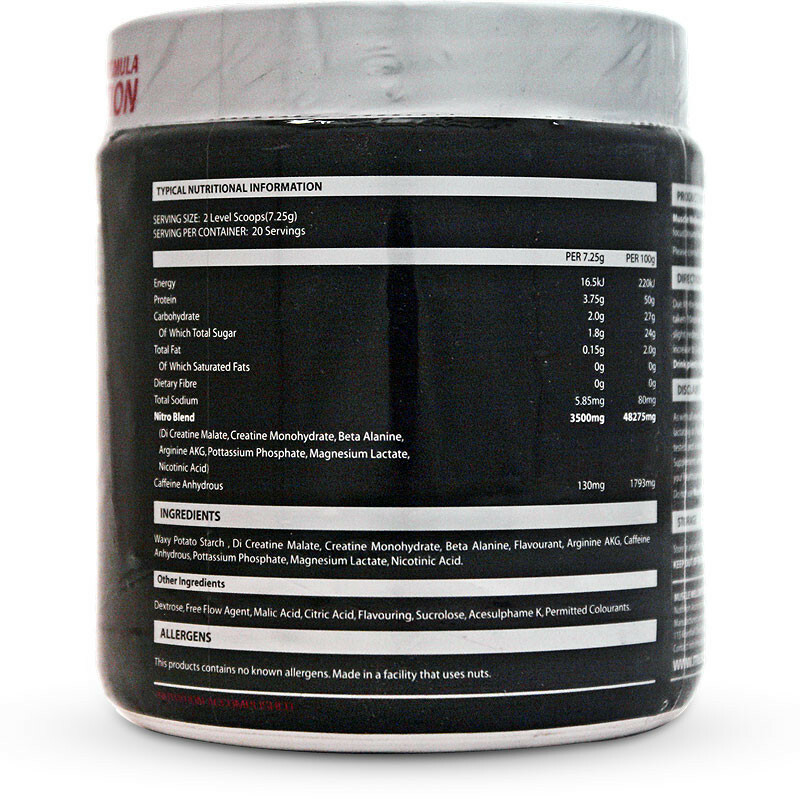 Added Arginine AKG to the Nitro Blend has been shown to increase nitric oxide (N.O) levels. Increased N.O levels improve blood flow by ‘enlarging’ blood vessels which gives better pumps during your workouts. 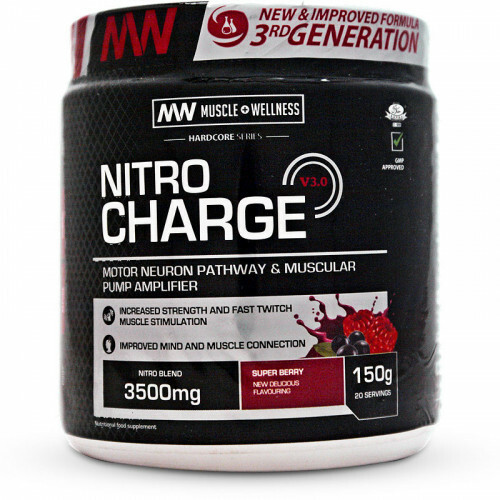 Muscle Wellness Nitro Charge is a great option for athletes who are sensitive to caffeine or lifters wanting a smooth performance boost. At the current price of R199 divided by 40 scoops each serving will cost just R5. Buying a cup of coffee will cost more than that! Waxy Potato Starch, Di Creatine Malate, Creatine Monohydrate, Beta Alanine, Flavourant, Arginine AKG, Caffeine Anhydrous, Potassium Phosphate, Magnesium Lactate, Nicotinic Acid. Dextrose, Free Flow Agent, Malic Acid, Citric Acid, Flavouring, Sucrolose, Acesulphame K, Permitted Colourants. • Test your tolerance and start with a single scoop serving mixed into 150ml of water. • Please note that an individual’s tolerance will vary. • You may increase to 2 scoops in 300ml if you are happy to do so. • Drink 10 minutes before your training. • You may experience a sudden rush of blood to your muscles which creates tingling and slight redness. • This is when you need to be training. As with all exercise and nutritional programmes, please consult your physician first. Do not use if you are pregnant or lactating or if you have any medical condition.Supplements are best utilized in conjunction with a healthy diet and goal orientated exercise routine. Always consult your healthcare professional before making changes to your diet or exercise routine. Do not use if you are allergic to any of the ingredients.